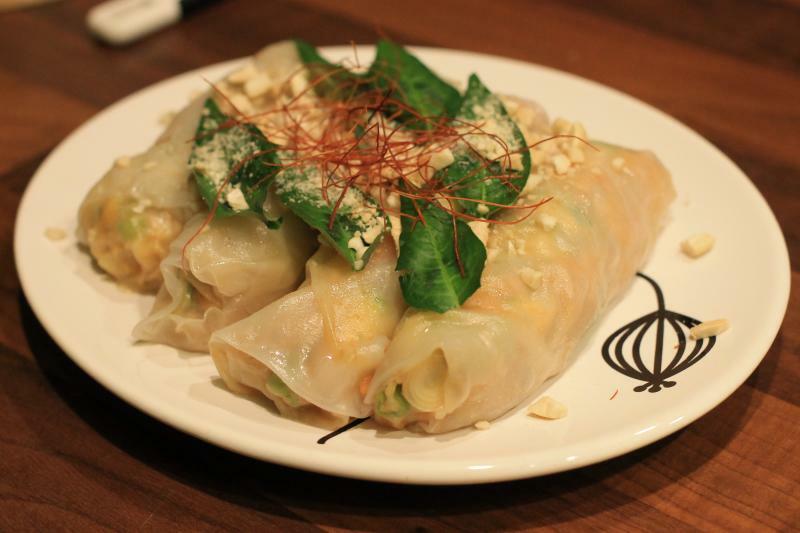 One of our favorite vietnamese snacks are this Vietnamese rice noodle rolls. Bánh cuốn is made from a thin, wide sheet of steamed fermented rice batter filled with a mixture of cooked seasoned ground pork, minced wood ear mushroom, and minced shallots. Sides for this dish usually consist of chả lụa (Vietnamese pork sausage), sliced cucumber, and bean sprouts, with the dipping sauce which is fish sauce called nước chấm. Sometimes, a drop of cà cuống, which is the essence of a giant water bug, Lethocerus indicus, is added to the nước chấm for extra flavor, although this ingredient is scarce and quite expensive. This light rice noodle rolls version is eaten by Vietnamese people for breakfast or as a light snack. It´s a good dish to use the things you want to get rid of. In general you can add anything you like. Just be creative. Our Bánh cuốn is a vegan version without meat. First of all mix veggies with soy sauce, cumin and curry powder. Soak one rice paper in lukewarm water for 20-30 seconds. You´ll get the right feeling for the rice paper after making a few! It depends on the kind of rice paper and how warm the water is. Place soaked rice paper on a chopping board and place the filling in the middle. Roll Bánh Cuốn like you do when you make spring rolls. Dab spring rolls in a bamboo steam basket and sprinkle with sesame oil. Steam for 5-6 minutes. Sprinkle with crashed nuts and herbs. Season with soy sauce and serve with fresh salad and chilis.